The different variants of races in the Nordic Short Tailed Sheep are very different regarding herd instinct. Sheep-Isle would like to collect various observations – positive or negative, regarding this distinct behaviour pattern. So, send an e-mail to tell about how you experience the herd instinct in your flock of “short-tails”. It can be a special happening or some more general observations you’d like to share with other readers of Sheep-Isle. We look forward to get lots of response from sheep breeders. Any photo of your flock are also welcome. We intent to translate Scandinavian mails to English and vice versa. Please write us your history, article or whatever, if possible, as a word-attachment. Inger Hansen, research worker at Tjøtta fagsenter Norway, opens op with the main article on “Flock Behaviour in Sheep”. But we have already got some more letters and we are looking forward just to hear from you! “There are many who ask if it can be of any use to take care of the old Norwegian Spælsau. To answer that question one must say, yes. First of all, it would be a shame for us if he (the race) disappears. Beside that, the spælsau is so distinct in several ways that he will be very usefull helping us forward in practical sheep breeding. Just the fact that this old breed stick together in flocks much better, and therefore are far easier to shepherd, than any other race in this country, should be reason enough to secure its lasting value for us. On the Scandinavian pages of Sheep-Isle there is a biography of Jon Sæland, this remarkable man in Norwegian sheep breeding. An English summary is on the slip. Until then, enjoy the photos! Jon Sæland calls the flock “the Old Norse Spælsau”. The Hiddle flock is the “mother-flock” of the Old Spæl Sheep. The eldest sheep in the flock stems from the flock on Austevoll owned by Olav Nausthiller (the first spælsau pedigree-book from 1912!). The younger ones is a mix of this Austevoll type, today called feral sheep, and an old type found in a remote part of the Setesdalen. The herd instinct is difficult to measure for conventional science. 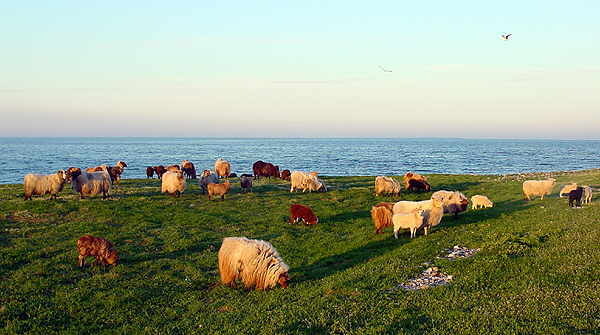 From the Faroe Islands there are examples of single individuals within a flock showing an “anti-herd instinct” and unwillingness to submit to the normal order of the flock. So, tell us about your observations – any “short-tail story” will do! Retur The Leader - and her flock - more to the right!